I'm one of the old-timers who lament the demise of steam engines. I sometimes dream of seeing a working locomotive going by, and I always feel a thrill and believe it is really happening. That dream came true while attending the 100th Anniversary of the opening of the Forth Bridge on October 8, 1990. As dusk darkened the skies, newly installed Scottish Power floodlights were switched on for the first time, fireworks exploded, and I heard a tiny British-style shriek from a streamlined steam locomotive high on the massive structure above us. The president of Scottish Rail was parking his private train, hauled by a vintage streamlined steam engine, in order to view the festivities. 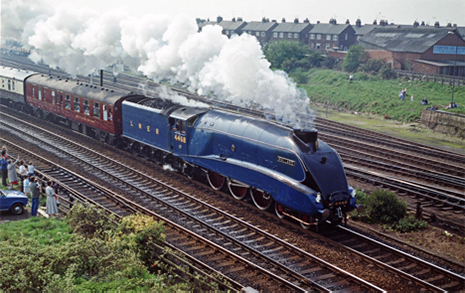 for steam locomotives, 124.88 mph, clocked on July 3, 1938. October 8, 1990. 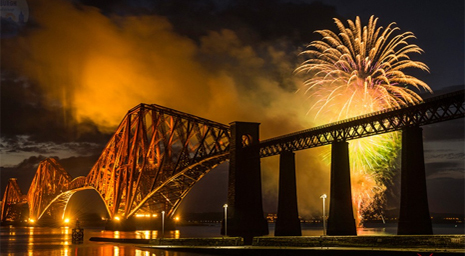 100th Anniversary of the Forth Bridge. Photo by 21CC Fireworks Ltd.
A rail fan acquaintance related a painful experience when in the San Francisco Bay Area decades ago. 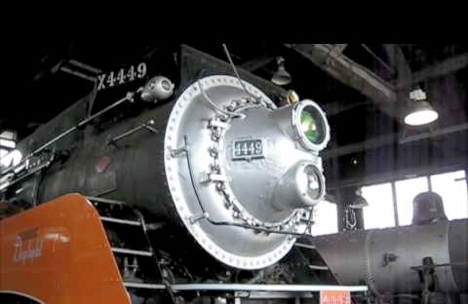 He watched while "Those Who Knew Best" junked the redundant red, orange, and black GS series locomotives designed in 1937 for the Southern Pacific Railroad's new "Coast Daylight." One can imagine that the locomotives added their dying screams to the cacophony of metallic grinding and crashing and banging. Fortunately, one engine was saved.The Model GS-4 engine #4449 was retired from revenue service in 1956 and put into storage. In 1958 it was donated, by the railroad, to the City of Portland, who then put it on static display in Oaks Amusement Park. Some old-timer visited it occasionally and oiled its bearings just in case it could ever be restored.That day came 1974 when it was painstakingly restored to operating condition and repainted in red, white, and blue to haul the bi-centennial American Freedom Train. Many technicians and mechanics had been tracked down out of retirement to do a host of repairs and rebuilding that only their unique memories and skills could handle. 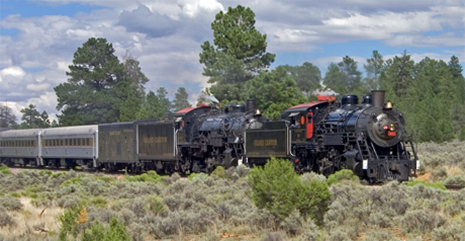 The 1976 American Freedom Train tours the 48 states hauled by Engine #4449. One chilly morning, we waited next to the commuter tracks between San Jose and San Francisco. We had lots of company; many young fathers and their sons who had never seen a live steam engine before were in attendance. We all gazed down the tracks awaiting the first puff of steam. The engine put on a thrilling show, with steam expanding in to the cold air, chuffs aplenty, and the sort of clanging and chugging that only steam engines can create. I was mesmerized as my old friend charged by. 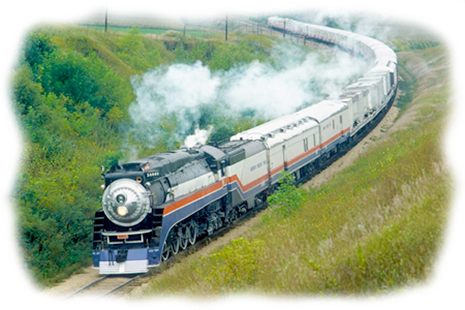 The engine, after her role powering the American Freedom Train, was stabled in Portland, Oregon. My father, Homer Hamlin, lived nearby. He had spent some time on the Southern Pacific serving as a fireman in the late 1940s on earlier models of the GS engines. He made some acquaintances at the Burlington Northern Railroad, in who’s barn #4449 was now sheltered, and arranged to take me to visit the vintage engine while it was at rest. The huge barn was casting shadowy light on the former Daylight engine. She loomed huge, larger than she’d ever looked, while operating, and strangely, uncharacteristicaly silent. Now once again wearing her authentic red, orange, black and silver livery she was fired up occasionally to haul railfan trips, and once to star in the Hollywood film "Tough Guys" with Kirk Douglas and Burt Lancaster. I grew up in San Luis Obispo, CA, along the Southern Pacific Railroad's Coast Line. The SP maintained a stable of oil-burning steam engines into the late 1950s, including the colorful GS locomotives that pulled the vintage, art-deco "Coast Daylight" trains between Los Angeles and San Francisco. The passenger station at San Luis Obispo is halfway between the two cities in a spectacular location, with San Luis Mountain looming to the west and eucalyptus and palm trees surrounding it. It was a great place to park with your boyfriend at night. Switch engines and helper engines produced a symphony of clanks and chuffs which made a pleasant accompaniment to adolescent hugs and kisses. Steam engines seem alive even while parked, noisily breathing steam while pumping up the air brake system. In action, having their working drive wheels, piston rods and cylinders exposed to view, makes them fascinating to watch. In 1956, my father was driving me to college at Stockton, California when we observed a railfan excursion. Happy passengers crowded the rear platform - festive with red and white bunting - of the steam-hauled train. I found this curious as there were still steam engines on the Southern Pacific at that time and I didn't realize until later that they had been replaced with diesels on most other railroads. The last time I recall seeing one of SP’s engines at work was in 1957. We were camping out on the Pacific shore in Santa Barbara County, and woke up at night to see, and hear, a black freight engine charging down the Coast Line right towards us. In my sleepy confusion I forgot that the track curved shortly before it reached the spot where we were camped and had a moment of panic. The age of steam is long gone. The steam locomotive has disappeared on main line service. 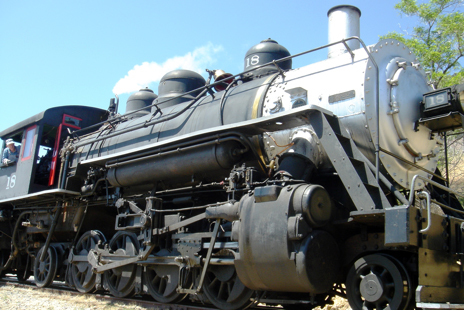 Diesel powered locomotives were introduced in the late 1930s and by the 1960s most steam engines headed for the scrap heap. Steam locomotives were high maintainance machines. They used water, and lots of it, requiring frequent stops for refilling water tenders. They required frequent lubrication of drive train bearings, usually done by a man with an oil can. They required careful nurturing, frequent inspections, and repairs, of steam boilers, which, operating at pressures of up to 350 lbs. per square inch, could result in catastrophic explosions if not carefully tended to. 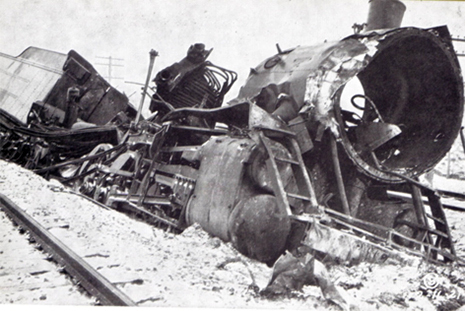 The results of such an apocalyptic event usually included the disappearance of the engine crew. The bottom line, of course, is economics. Though initially expensive to purchase, the cost of operating and maintaining a diesel locomotive was quickly proved to be much lower than the cost of steam locomotives. It is still possible to view and to ride behind steam locomotives maintained for their tourism value. Subject to regular inspections by the Federal Railway Administration, they are as safe (or safer) than the average amusement park ride. Here are some examples in the Western United States, available for aficionados. 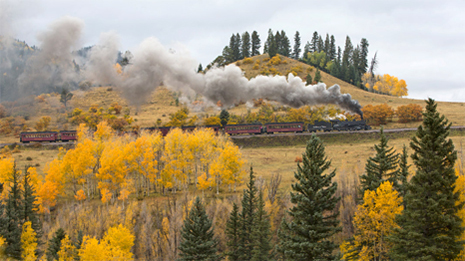 The Cumbres & Toltec Scenic Railroad. Colorado and New Mexico. 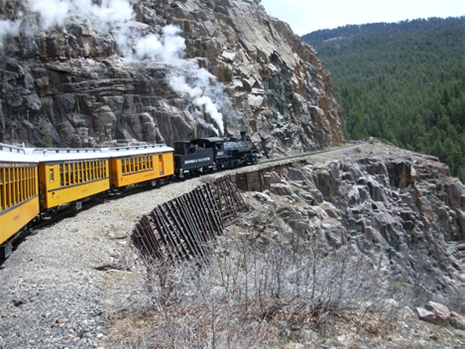 Durango and Silverton Narrow Gauge Railroad, Colorado. 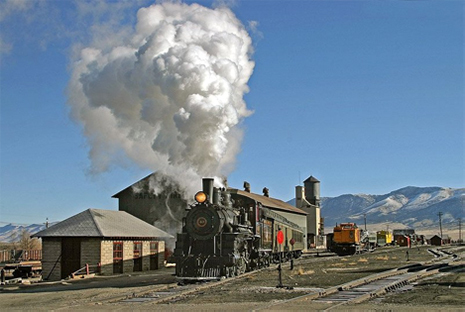 Nevada Northern Railway, Ely, Nevada.